Classical Guitars - urs-langenbachers Webseite! 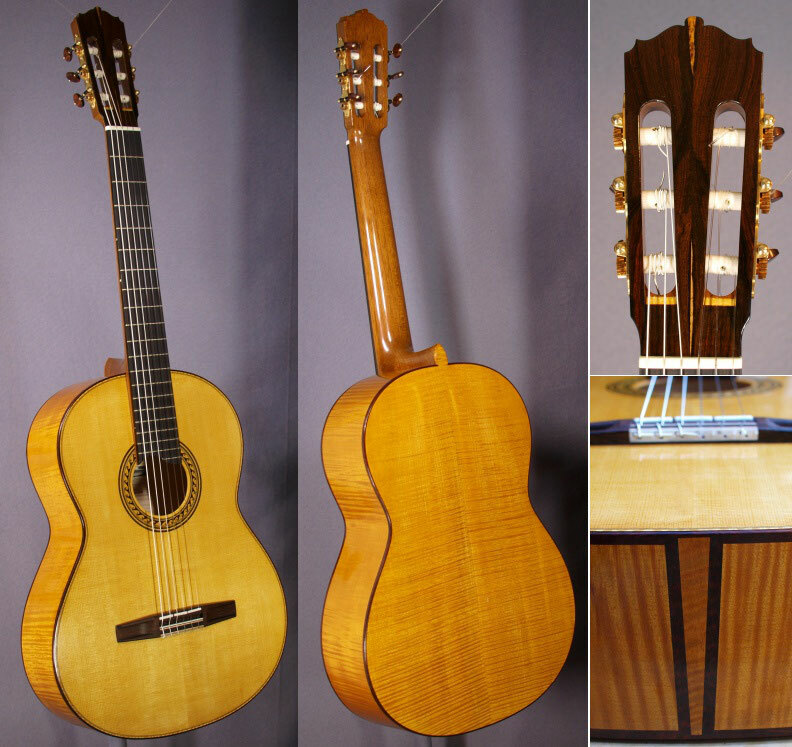 Each instrument is an individual project based on the particular customer's requirements. All my guitars are built in the traditional spanish technique. I use carbon-fibre reinforcements on the neck. My fingerboards are transversely curved and they are normally elevated to provide easy access to higher registers up to the 20th fret. All decorative inlays are handmade. The instruments are french polished. My standard tuners are made by Scheller and offer the best functionality due to the ball bearing mechanism. I like to use this classic spanish plantilla for projects with shorter string length. 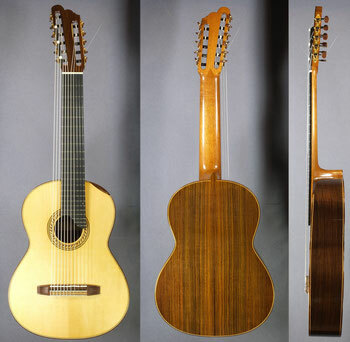 You see a 64cm string length model. It is fitted with an armrest as an extra feature. The bridge has adjustable saddles to allow for compensation correction. 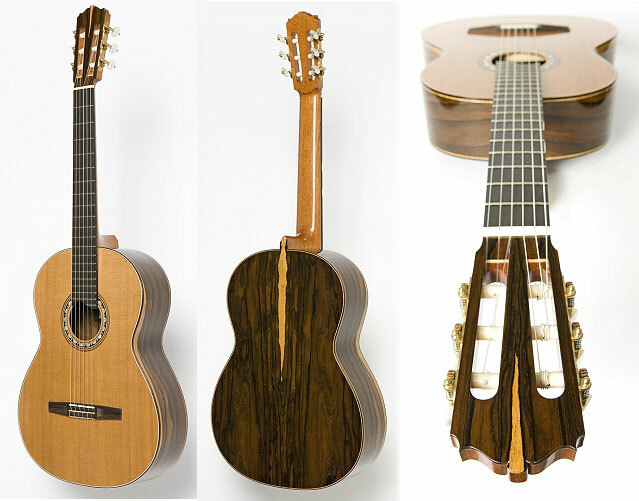 The fingerboard is slightly elevated to make it easier to play in higher registers. 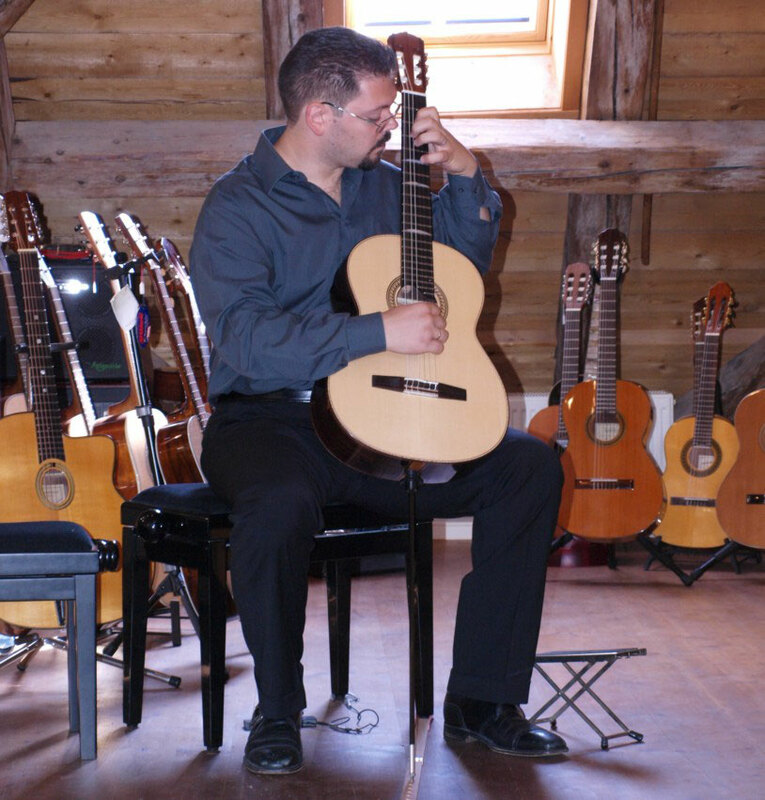 The use of a soft suspension for the top allows me to achieve a deep fundamental resonance whilst also ensuring that the instrument is comfortable to play and delivers a wide range of colours. The same plantilla as above can also be ordered with a traditional bridge and traditional fingerboard. I use my own larger mode only for 65cm string lengths. Due to the larger plantilla, the top reacts more tautly than on the model with smaller body at the same Helmholtz resonance level due to the larger surface area. For this exclusive model made of Cedar and Ziricote I was awarded the German Musical Instrument Price 2008. I prefer to use European maple, spruce and other prime quality native woods. They perform just as well as tropical timbers. 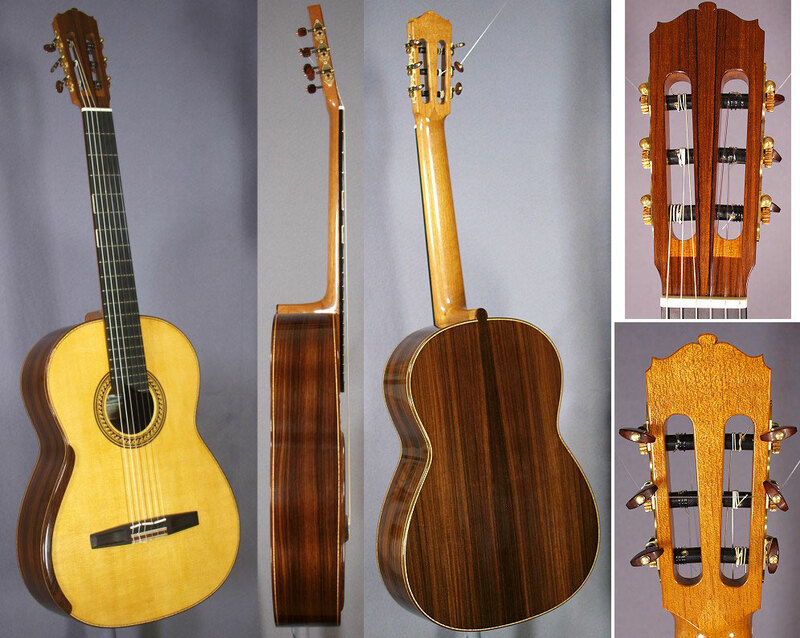 Ermanno Brignolo ordered this upright model. The picture shows him playing in the workshop using the spike. Listen to a sound example here. This model has a prolongated 7th string tuned a fifth below the 6th. It can be played on the fingerboard as usual. 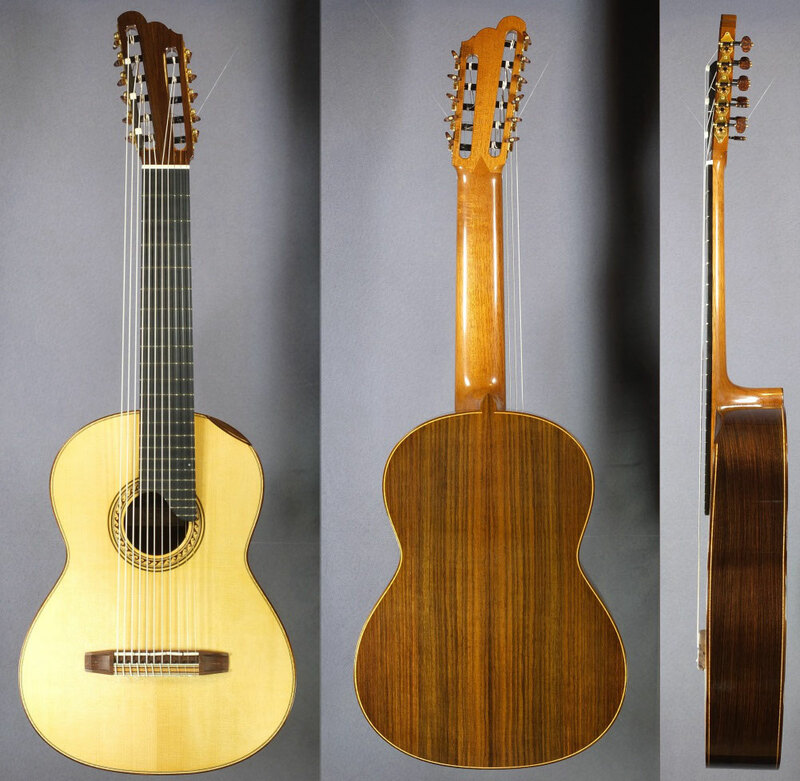 If you are using the capodaster on their second fret, the tuning is an ordinary fourth below the 6th. 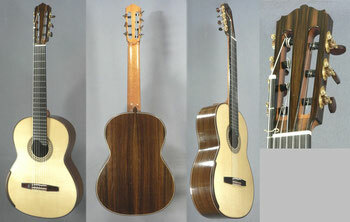 On my 11-string classical guitar you find 8 strings playable on the fingerboard. 9th, 10th, 11th are free basses. 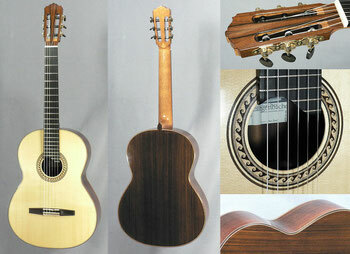 The fingerboard does not have to be wider and provides good weight-balance for easy handling. 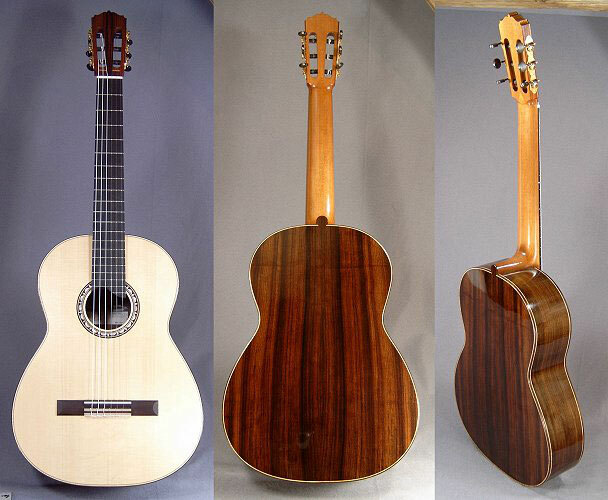 The string length of the basses is prolonged step by step to allow the string diameter to remain nearly the same. You can hear this instrument at the concerts of José de Aragon.